LOOKING FOR THE PERFECT HOME FOR ENTERTAINING AND FAMILY TIME? THIS STUNNING HOME NESTLED ON A 1/2 LOT IN NE SUFFOLK SCHOOL DISTRICT WITH A HUGE DECK IN THE BACKYARD IS MOVE IN READY & READY FOR A 30 DAY CLOSE! YOU WILL LOVE THIS SPACIOUS & OPEN FLOOR PLAN WITH A HUGE, UPDATED KITCHEN EQUIPPED WITH GRANITE COUNTERTOPS, STAINLESS STEEL APPLIANCES, TILE BACKSPLASH, CUSTOM CABINETS & GAS RANGE. BUYER TO SELECT NEW HARDWOOD FLOORS UPSTAIRS AND NEW STAIN FOR OUTDOOR DECK. TECHNOLOGY UPGRADES TO CONVEY WITH PURCHASE INCLUDE: WHOLE HOME CONTROL 4 SYSTEM, EXTERIOR:2 EXTERIOR ROCK SPEAKERS, 2 EXTERIOR SPEAKERS 5 SPEAKER SURROUND SOUND SYSTEM ON REAR DECK,TV. KITCHEN: 2 SPEAKERS,TV. 2 SPEAKERS IN DINING ROOM.LIVING ROOM:5.1 SURROUND SOUND SYSTEM, TV, PREWIRED FOR PROJECTOR AND SCREEN. MASTER: SUBWOOFER, 2 REAR SPEAKERS AND SOUND BAR,TV. FROG: 5.2 SURROUND SOUND SYSTEM,TV. O/A. SQ. FT PER SELLER. 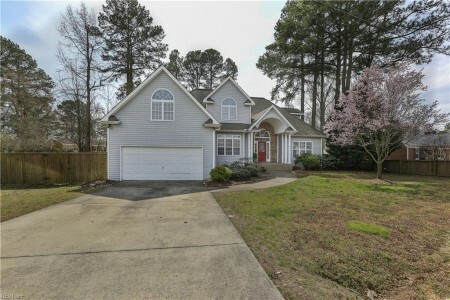 Send me more information about the listing at 3625 Frazier, Suffolk, VA 23435, MLS# 10247010. This 5 bedroom, 3 bathroom home located at 3625 Frazier, Suffolk, VA 23435 has approximately 3,000 square feet. It is currently listed for 399900.00 and has a price per sqft of $13,330. This home is currently Active under the MLS#: 10247010. It is listed by Fit Realty. 3625 Frazier, Suffolk was built in 2001. It has Garage Att 2 Car, Oversized Gar, 2 Space parking. The kitchen includes Dishwasher, Dryer Hookup, Microwave, Gas Range, Refrigerator, Washer Hookup. 3625 Frazier is part of the Milteer Acres neighborhood located in 23435.